A spiritual highlight and focal point of the Annual Pilgrimage to Lourdes is the Mass with the Anointing of the Sick. It is during this celebration when all of our prayers and the whole purpose of our Pilgrimage are given their fullest expression. Each year we are asked to assist the Bishop of Tarbes and Lourdes in ensuring that the Sacrament of the Sick, a central part of the Church’s Liturgy, is celebrated with great care and attention. Only bishops and priests may be ministers of the Sacrament of the Anointing of the Sick. A penitential rite followed by the Liturgy of the Word opens the celebration. Scripture awakens the faith of the sick and family members and friends to pray to Christ for the strength of his Holy Spirit. 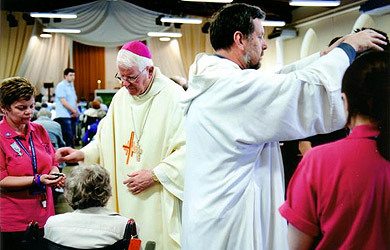 The priest lays his hands on the head of the sick person. He then proceeds to anoint, with the blessed Oil of the Sick, the forehead and hands of the sick person (in the Roman Rite). He accompanies these acts with the words, “Through this holy anointing may the Lord in his love and mercy help you with the grace of the Holy Spirit. May the Lord who frees you from sin save you and raise you up” (CCC, no. 1513).